Pizza buffet with salad bar. 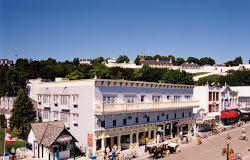 Located in the Murray Hotel on Mackinac Island. Menu here. Facebook page for Murray Hotel is here.